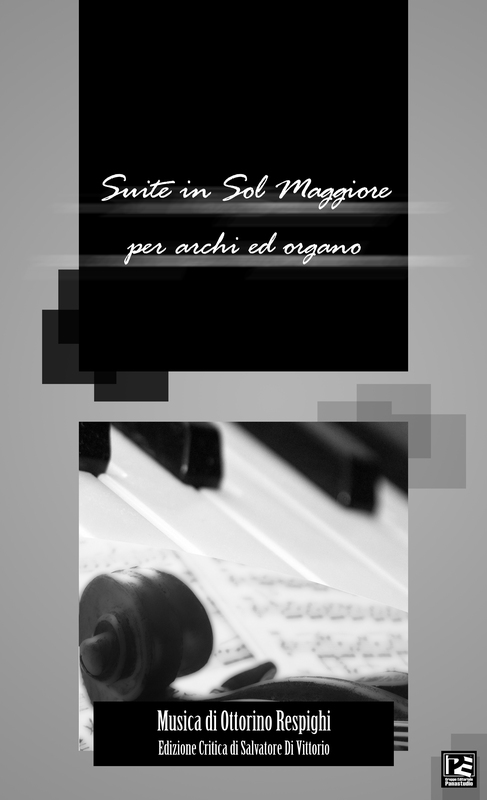 The Suite in Sol Maggiore for strings and organ was composed in 1905. It is a neo-baroque work and homage to J.S. Bach, Girolamo Frescobaldi and Arcangelo Corelli. Overall, the piece is modeled on the style of the Concerto Grosso, where the organ serves as the concertino (solo) instrument and the strings are the ripieno (ensemble). The forward momentum of the Preludio first movement (here, in its original longer version) is quite exciting, lush and colorful – giving us a taste of Respighi’s later flair for stout orchestration, with trills abound. The second movement Aria, which was originally composed as a one movement work in 1901, is here transcribed by Respighi to include organ. Respighi clearly loved this music, for he also included the one movement Aria in another work the same year, his Suite for Flute and strings No. 2. This expressive ‘aria di chiesa’-styled work is quite lyrical, yet simple and well-balanced in form. In addition, the music is remarkably poignant – if not dramatic – for such an early piece of Respighi. It demonstrates Respighi’s natural ability for romantic gestures and evolving dynamics. The influences stemming principally from Frescobaldi become more apparent as the music unfolds in later movements, Pastorale and Cantico. Frescobaldi’s madrigal-like melodies with simple textures in minor, together with a mix of chromaticism and use of embellished ornamentations clearly inspired the young Ottorino Respighi. Several Frescobaldi works come to mind for this particular comparison. The Ricercare in Frescobaldi’s Mass of the Virgin, as one example, highlights the kind of devices present in Respighi’s Organ Suite. Frescobaldi used a typical monothematic theme with chromatic subject, together filled with moments of augmentation and an ever-present pedal note passage near final cadences. All of these characteristics are also made available in the variety of Toccatas in Frescobaldi’s highly influential work Fiori Musicali. It was well known by Respighi’s time that certain pieces from Fiori Musicali exemplified great musical achievement, and were thus used as models in Johann Joseph Fux’s 18th century composition treatise Gradus ad Parnassum – the most important textbook for composers. And Frescobaldi’s influence on the young Respighi is quite noticeable here as a result. Frescobaldi’s Toccata Avanti la Messa Della Domenica from Fiori Musicali is another wonderful testament of the combined influences manifested in Respighi’s Organ Suite. Frescobaldi’s modal awareness and incessant nature for clarity of line, that is, the simple ascending or descending flow of melodies – at times, occurring in sixths, are in full display here. As a whole, the Organ Suite is a wonderful accomplishment for Ottorino Respighi, as it cultivates his musical instincts and further refines his ideals for orchestration and melody for years to come.